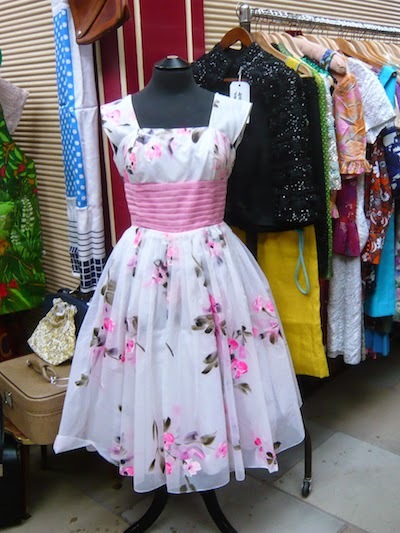 For me this beautiful 50s hand-painted prom dress was the star of the show. Julia at Mary Jones Vintage told me it belonged to a diplomat’s wife who bought it for her daughter, who apparently dated Gregory Peck. Maybe she wore this dress on a date with Gregory! It was sold today to another young lady with a generous mum for her prom dress. She shall be the belle of the ball, I am sure. 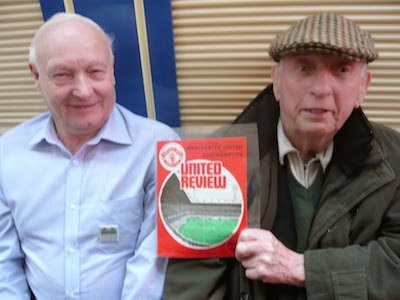 This is Jim (not mine) and Keith holding a copy of a Manchester United vs Southampton match programme, signed by the very gorgeous George Best. Seeing as it was Derby day on the same day as the fair, it seemed quite appropriate to include it. I had to include another gorgeous guy: Billy Fury. If you take trip to New Brighton, there is a place called Fort Perch Rock on the sea front which has lots of Billy Fury, Elvis and Beatles memorabilia, including a lovely handwritten letter from Billy's mother Jean thanking someone for looking after her son whilst he was at a recording studio. Here's Jim - mine this time! 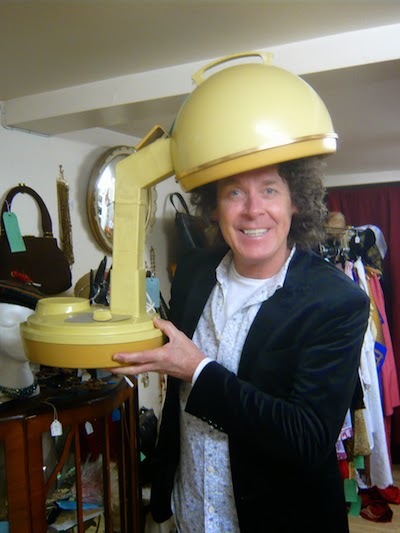 - demonstrating a 1960s Lady Schick Consolette Hairdryer. I think most of us could have done with a pamper at the salon after enduring the wind and rain at this fair. 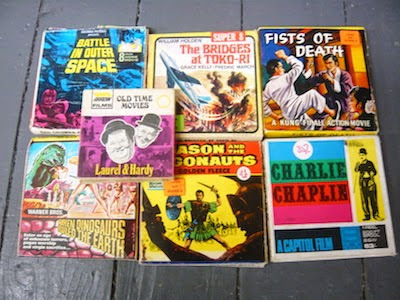 The covers are a riot of colour and look very exciting, even if they probably aren't . . . sorry Duncan!! 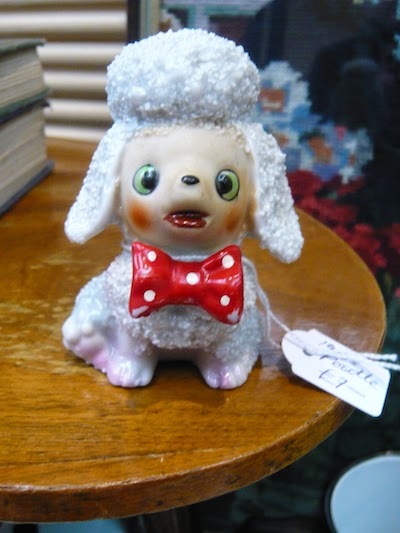 A cute little Sugar Poodle caught my eye, so much so that it came home with me, and I have named it Fifi of course. Thank you Caroline at Shiny Shilling for the best £7.00 of the day. What a delightful selection! 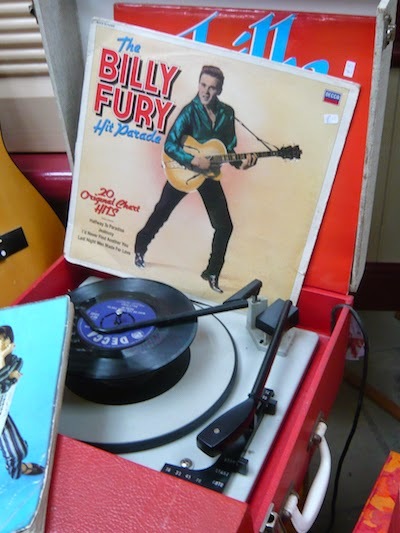 Thank you Fiona for sharing your personal tour of highlights from the Billy Fury fair, and I hope you're relaxing with a nice drop of sherry after all your hard work! If anyone else fancies being our Finder of the Fair, please get in touch via our Contact us page, or on Facebook or Twitter. Hi everyone my name is Fiona and I enjoyed being the Finder for the Billy Fury Fair, even though the weather had a certain fury about it. I love anything 1950s so it took me a while to tear myself away from the amazing cars at the entrance and get on with my Findings! I am a new girl in Stockport but enjoy coming down to the Vintage Village with my partner Jim. We have been coming since the start and have watched it grow into a wonderful fun day out. Hope you enjoy mine (and Jim's) finds! 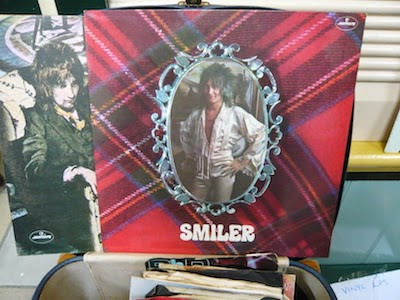 Doesn't Rod Stewart look fab in silk and satin on the front cover of his 1974 Smiler album? A bargain at only £1.00. Today I heard that vinyl is to have its own chart each week - welcome back, I say. I may have to go into the loft for my box of singles, make sure my name is on them and find a few parties to take them to! Oooh, feeling lightheaded! A superbly clever idea by Paul of WYSIWYG. 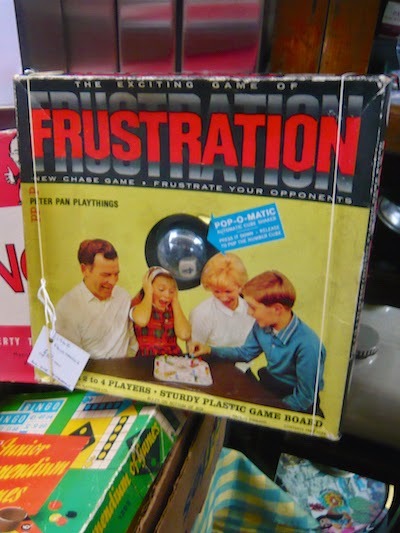 Well this 1965 version of Frustration from All Our Yesterdays clearly summed up how I felt trying not to include everything at the fair today! 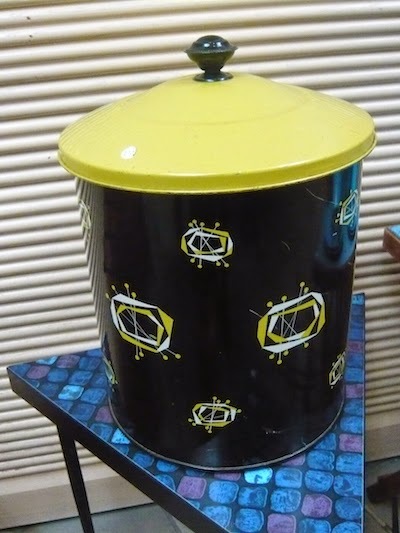 Wasn't the 1950s a wonderful decade; even the coal buckets were glamorous! Boomerang Vintage brought it all the way from Staffordshire in their newly mended van. So glad they made it to the fair as it was quite a delightful sight. 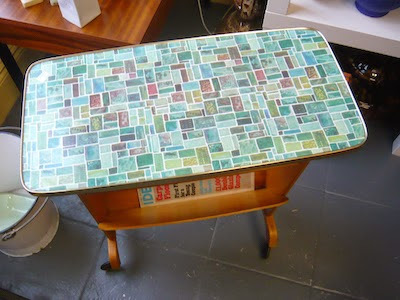 German 1950s magazine rack, a lovely piece of furniture with a colourful top that looks like mosaic. 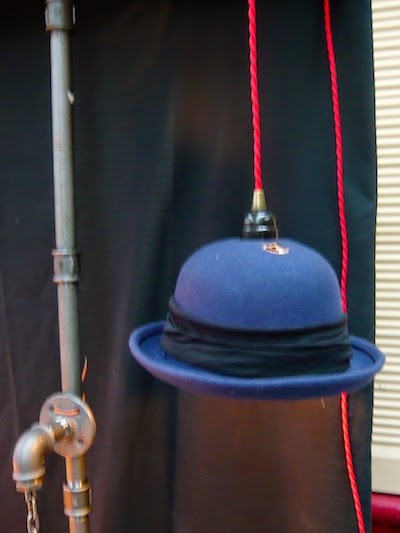 To me, it was the nicest piece in the fair, even though it was across the road at Snygg in 20th Century Stores! 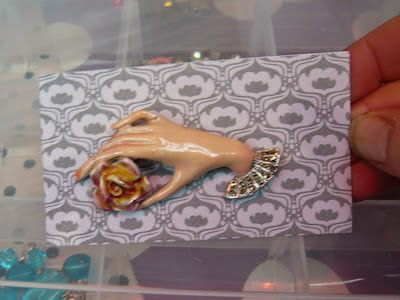 A very pretty 1950s brooch twinkled away on the stall that belonged to Suzylovesmilo, only £10.00 but I am afraid Fifi had already fluttered her eyelashes at me and was stashed away in my bag. When I was younger my boyfriend's (not Jim!) mum had a 1950s bar in her parlour, which I hated. 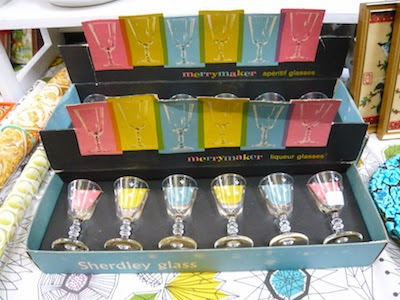 How I wish I could have one in my house now as I would fill it with delightful items like these colourful Merrymaker liqueur glasses by Sherdley Glass. A small sherry to savour whilst wearing the beautiful prom dress, then being whisked away by Billy Fury in an Oldsmobile eighty eighty . . . on my way to a Wond’rous Place.